The 1963 AD eruption of Agung volcano was one of the most significant twentieth century eruptions in Indonesia, both in terms of its explosivity (volcanic explosivity index (VEI) of 4+) and its short-term climatic impact as a result of around 6.5 Mt SO2 emitted during the eruption. Because Agung has a significant potential to generate more sulphur-rich explosive eruptions in the future and in the wake of reported geophysical unrest between 2007 and 2011, we investigated the Late Holocene tephrostratigraphic record of this volcano using stratigraphic logging, and geochemical and geochronological analyses. We show that Agung has an average eruptive frequency of one VEI ≥2–3 eruptions per century. 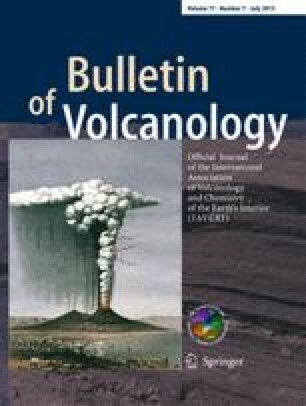 The Late Holocene eruptive record is dominated by basaltic andesitic eruptions generating tephra fall and pyroclastic density currents. About 25 % of eruptions are of similar or larger magnitude than the 1963 AD event, and this includes the previous eruption of 1843 AD (estimated VEI 5, contrary to previous estimations of VEI 2). The latter represents one of the chemically most evolved products (andesite) erupted at Agung. In the Late Holocene, periods of more intense explosive activity alternated with periods of background eruptive rates similar to those at other subduction zone volcanoes. All eruptive products at Agung show a texturally complex mineral assemblage, dominated by plagioclase, clinopyroxene, orthopyroxene and olivine, suggesting recurring open-system processes of magmatic differentiation. We propose that erupted magmas are the result of repeated intrusions of basaltic magmas into basaltic andesitic to andesitic reservoirs producing a hybrid of bulk basaltic andesitic composition with limited compositional variations. The online version of this article (doi: 10.1007/s00445-015-0943-x) contains supplementary material, which is available to authorized users. We thank CVGHM for logistic support during fieldwork and RISTEK for research permits. We are grateful to Anwar Sidik, I Nengah Wardhana and Dewa Mertheyash from the Rendang Volcano Observatory for their hospitality and help in the field. Ryuta Furukawa is thanked for introductions to key outcrops. Tanya Furman is kindly acknowledged for sharing the work by Doust (2003). Reviews by John Pallister and Mary-Ann del Marmol, and editorial handling by James Gardner were greatly appreciated. Fieldwork and laboratory analyses were funded by the Earth Observatory of Singapore. Data interpretation and writing was performed at Oxford (NERC grant NE/I013210/1) and Ghent universities.